I use Chrome as my default web browser and I have added two different Chrome extensions that let me determine the influence of a Twitter account directly on Twitter.com. The first one is by Klout and it lets you see the Klout score of a Twitter user, right next to the user’s name. 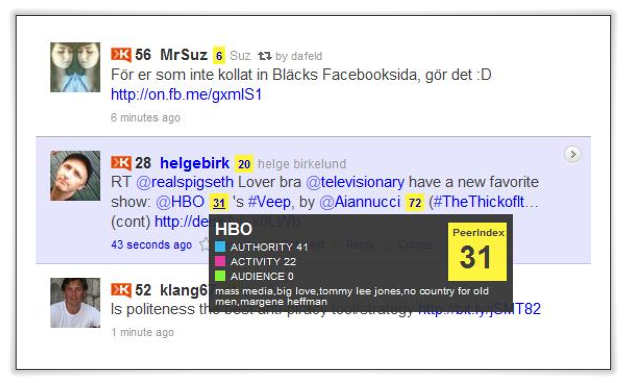 I have also used a Chrome extension for PeerIndex, but it only displayed the score if you clicked on a person’s profile. I now see the PeerIndex score next to each account’s Twitter handle, but also all the other accounts that are mentioned in each tweet. If you click on it you are taken directly to the account page on PeerIndex for more details. Also, if I drag the mouse over the score box, it shows a more detailed score of authority, activity and audience, and also some tags that represent the top topics by this Twitter user. This may be used to more quickly get a better picture of different Twitter users and people you may or may not want to follow. If Klout and PeerIndex scores are accurate tools for determining real influence, well that’s an entirely different blog post. Footnote: My PeerIndex profile is here.